With Series X, Red Dwarf was no longer a show that was being briefly revived for a nostalgic special: it was back to being a current, living, breathing series. And although The Beginning had ended on an appropriate note for what could have been the last episode ever, the outstanding viewing figures and warm reception from fans and viewers meant that an eleventh series was an inevitability almost as soon as the tenth began airing. But once again, getting the wheels turning for as complex a production as Red Dwarf - not to mention lining up the schedules of everybody involved - takes time. And in this case, it took long enough to get the eleventh series going that it began to become apparent that the best use of everybody's time would be to produce two series back to back. 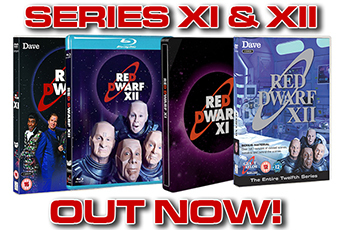 And so in May 2015, it was announced - once again in front of a rapturous crowd at the Fan Club's Dimension Jump convention - that Red Dwarf XI and XII would be going into production later that year. Six episodes would be shot at the end of 2015, with the remainder following immediately at the start of 2016. And there were further changes from last time, too: Baby Cow Productions became the show's new production partner alongside Grant Naylor Productions, and shooting moved from Red Dwarf's old home of Shepperton Studios over to the famous Pinewood. Where Red Dwarf X had made the most of a limited budget and largely aimed for a pared-back, ship-bound, character-driven feel, Red Dwarf XI was a bit freer to expand. With many of the elements now already in place, there was scope to bring in a brand new Starbug set, meaning that episodes could once again take on the adventuring spirit of the show's "middle" era. 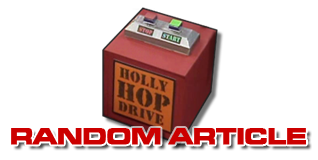 There would be a much wider range of guest characters and actors, new locations, and the dazzlingly imaginative new concepts that have always been Red Dwarf's stock-in-trade. 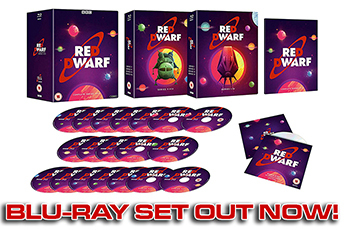 In another first for the show, Red Dwarf XI's episodes debuted online a week prior to their broadcast on Dave in September (or, as it was dubbed in publicity, "Smegtember") 2016 - but this barely put a dent in the viewing figures on transmission, and despite a wider industry trend towards dwindling numbers on live broadcast, Red Dwarf retained a superbly strong audience share each and every week, and was greeted with an even better critical reception than the series before it.